Earlier this week, word got out that Michelle Williams got paid a per diem for quickly reshooting scenes for “All the Money in the World” ahead of its release. That per diem amounted to $80 per diem, totaling less than $1,000. Her costar Mark Wahlberg, on the other hand, was paid a whopping $1.5M for the reshoots. As USA Today notes, “that works out to Williams being paid less than one-tenth of 1% of her male co-star.” Isn’t that crazy?! In light of this revelation, the Screen Actors Guild (SAG) is investigating the matter to see if any rules were violated during the making of the film. This isn’t the first time men and women have faced a pay disparity. Far from it. But now, calling out pay disparity has become a public way to shame companies for making their employees feel undervalued. This has been happening several times in news. After “Today” host Matt Lauer was fired, it was reported that Hoda Kotb and Savannah Guthrie would take over as co-hosts. Kotb and Guthrie would each be paid $7M, with their combined salaries making $14M. Later was making $25M, making the difference between his salary and those of his two co-hosts $11M. Last month, E! Entertainment host Catt Sadler left her job of 12 years, because she was paid half as much as her male co-host Jason Kennedy. Her departure did not go unnoticed: Actresses Debra Messing, Laura Dern, and Eva Longoria confronted this year’s Golden Globes red carpet pre-show hosts Guiliana Rancic and Ryan Seacrest over the issue. Awareness of pay disparity has also spread around the world. Former BBC News editor Carrie Gracie quit her position earlier this month once she learned that she had been severely underpaid throughout her career. The pay disparity problem has also crossed racial lines. “Hawaii Five-O” stars Daniel Dae Kim and Grace Park each left the series last year due to pay disparity between themselves and their white costars. Though the two had been with the show since 2010, their respective raises were still 10-15% lower than those of their white costars. It’s excellent that pay disparities are finally coming to light! Let’s hope they spur some lasting changes toward equality. With all the wokeness spreading, it was only a matter of time before entertainment began reflecting our new reality. And gender is part of that. The second season of Showtime’s “Billions” introduced Taylor Mason, a character played by actor Asia Kate Dillon. Dillon self-identifies as non-binary, meaning they don’t identify as strictly male or female. (Dillon’s preferred pronouns are “they,” “them,” and “their.”) Not only is Dillon non-binary, but their character is too. This is also the first time a non-binary actor has played a non-binary character. Let’s hope that Dillon and her “Billions” character bring non-binariness further into public knowledge. In addition to being the Amazonian Princess of Themyscira and civilian Diana Prince, Wonder Woman can add another title to her resume: United Nations’ Honorary Ambassador. Wonder Woman’s promotion will kick off a campaign dedicated to women’s empowerment. This ties into the U.N.’s sustainable development goal 5, which promotes worldwide gender equality. Though Wonder Woman will be used as a symbol of women’s empowerment throughout the world, it’s worth noting that most of the top U.N. jobs are held by men. Wonder Woman will be formally announced as the honorary ambassador on October 21st, 75 years after her character first debuted. Actresses Lynda Carter, who’s played the character in the 1970s TV show, and Gal Gadot, who’ll depict the character in a big-budget DC Comics movie next year, are expected to attend the ceremony. 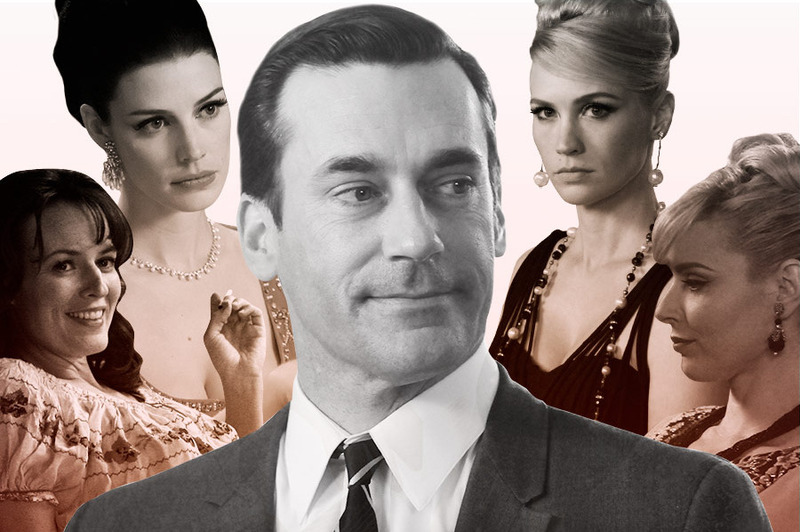 Today’s post is an update of this post, in celebration/memoriam of last night’s “Mad Men” series finale. Now that the series has ended, we can make more definitive statements on what kind of women Don prefers. Everyone who watched the show knows that Don Draper (Jon Hamm) is a serial womanizer. Even when he’s married, he can’t stay faithful. It’s part of what makes him so intriguing: we know he’s wrong, but we couldn’t stop watching! There’s been some ink spilled on the types of women he tends to bed, such as preferring docile women for marriage versus favoring strong-willed career women for affairs. But I was curious to find out if there were any other patterns, and so had some fun with Excel. If you can’t see, I listed the names of Don’s 19 partners by season, their relationship to Don, occupation, hair color, religion, and overall length of the relationship. (Some of these metrics I didn’t end up using.) Some of these things I tried finding information as accurate as possible (such as the years each relationship spanned), but sometimes had to make a close guess. So if you see an error, please correct me and I’ll recalculate. Now, let’s find some patterns via pivot tables. I broke down Don’s relationships into three types: wife, affair and one-night-stand. I defined affair as on-going with an emotional component, whereas I defined one-night stand as purely sexual, even though it may have happened more than once (as is the case with season 4’s Candace and season 7’s Tricia). We know he’s been married twice (I’m not counting Anna Draper, as she was never a conquest), so no surprise there. I figured Don has had more casual partners than serious ones, but I didn’t realize how much it would skew. Don’s had over three times as many affairs and one-night stands combined as he has married and dated partners combined. Interesting. I was interested to see if Don had any particular type in terms of career. Though every woman was different, four occupations reoccurred, and all of them roughly at the same rate. Two of the 16 women (12.5%) were housewives, which were his first wife Betty and later season 6’s Sylvia Rosen. Another pattern that emerged were two actresses, who also held other jobs when Don knew them. These two were season 4’s Bethany Van Nuys (whose other job was a supernumerary) and his second wife Megan Calvet (who began as a secretary). Don’s partners in season 7 made a couple more occupations a trend. Tricia was the second stewardess, with the first being season 3’s Shelly. Waitress Diana came after season 4’s Doris, also a waitress. No, Don’s more of a brunette man, with nearly half his partners sporting the color. He prefers blondes slightly more than redheads. I initially wanted to see how each partner’s religion broke down. Several did not mention or show any religious leanings, so I referred to their respective affiliations as “N/A,” because I didn’t want to automatically put partners into a “default Christian” category. 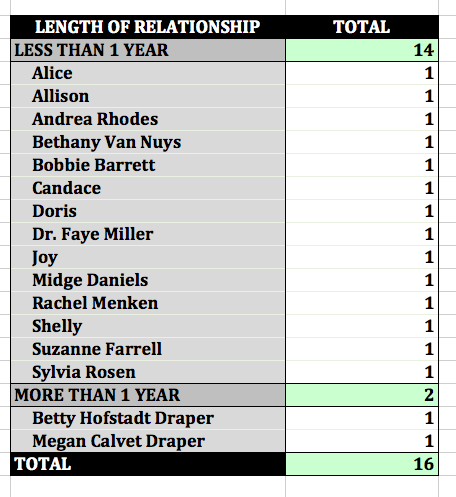 Only two of the 16 partners (12.5%) were overt about their religious affiliation: season 1’s Jewish department store heiress Rachel Menken, and the Catholic Sylvia Rosen (season 6, though she’s married to a Jewish man). Other partners signaled their religious leanings indirectly. Season 4’s Dr. Faye Miller (Cara Buono), referenced her Jewish heritage in passing, using a Yiddish phrase. Season 2’s Bobbie Barrett was confirmed to be Jewish by none other than show creator Matthew Weiner himself. What we can take from this is that while religion certainly isn’t a conscious preference of Don for his partners, he has selected distinctly Jewish women. I initially had assumed that some would’ve spanned more than a year, but the only partners with proven staying power have been his wives Betty and Megan. Delving into the metrics of Don’s sexual partners reveals some interesting findings: He prefers brunettes, doesn’t discriminate on the basis of religion or career, and has a short attention span when it comes to women. This week, we’re examining sexuality data from the 1960s, in celebration of the upcoming final half-season of “Mad Men” beginning Apr. 5th. Everyone who watches the show knows that Don Draper (Jon Hamm) is a serial womanizer. Even when he’s married, he can’t stay faithful. It’s part of what makes him so intriguing: we know he’s wrong, but we can’t stop watching! If you can’t see, I listed the names of Don’s 16 partners by season, their relationship to Don, occupation, hair color, religion, and overall length of the relationship. (Some of these metrics I didn’t end up using.) Some of these things I tried finding information as accurate as possible (such as the years each relationship spanned), but sometimes had to make a close guess. So if you see an error, please correct me and I’ll recalculate. I broke down Don’s relationships into three types: wife, affair and one-night-stand. I defined affair as on-going with an emotional component, whereas I defined one-night stand as purely sexual, even though it may have happened more than once (as is the case with Candace the prostitute). We know he’s been married twice (I’m not counting Anna Draper, as she was never a conquest), so no surprise there. I figured Don has had more casual partners than serious ones, but I didn’t realize how much it would skew. Don’s had three times as many affairs and one-night stands combined as he has married and dated partners combined. Interesting. I was interested to see if Don had any particular type in terms of career. But every woman was so different that only two things reoccurred. 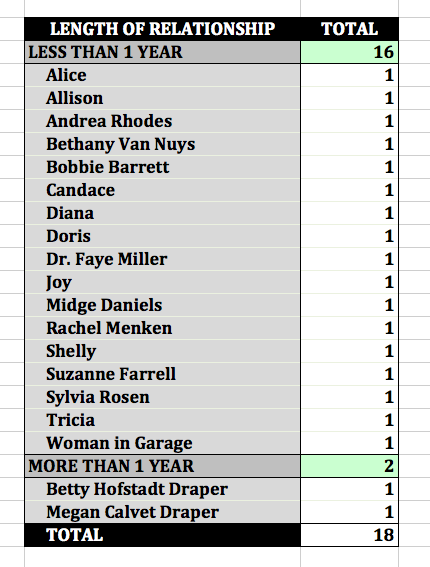 Two of the 16 women (12.5%) were housewives, which were his first wife Betty and later season 6’s Sylvia Rosen. Another pattern that emerged were two actresses, who also held other jobs when Don knew them. These two were season 4’s Bethany Van Nuys (whose other job was a supernumerary) and his second wife Megan Calvet (who began as a secretary). No, Don’s more of a brunette man, with nearly half his partners sporting the color. Blonde and redhead are nearly equal, with blonde pulling ahead by one partner.